Strawberries are definitely out of season at this time of the year, but when your daughter is celebrating her birthday and she wants a strawberry dessert, you make sure that you have fresh strawberries. To tell the truth it wasn’t too hard to find strawberries, but at this time of year you have to pay more for them and they are not quite as tasty as when you buy them in season. 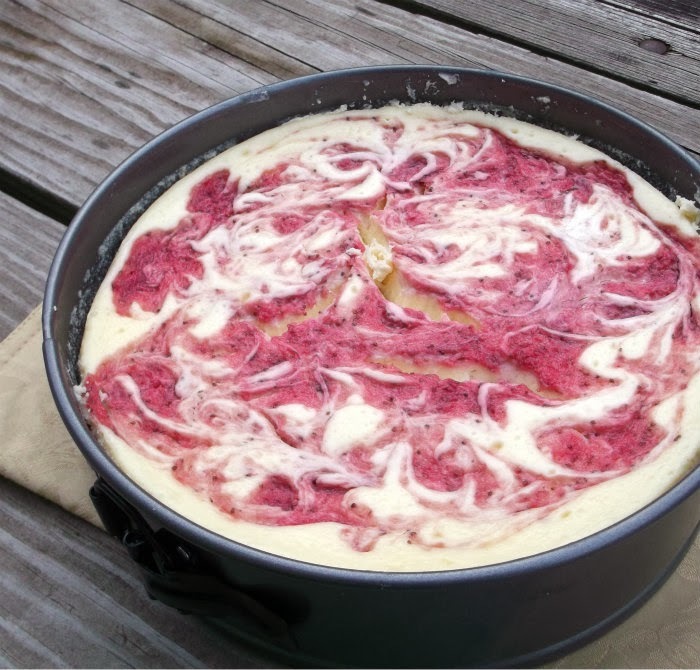 I needed fresh strawberries for this strawberry swirl cheesecake that I made for our daughter Krista’s birthday. It’s funny how no one in my family ever asks for a traditional birthday cake on their birthdays. 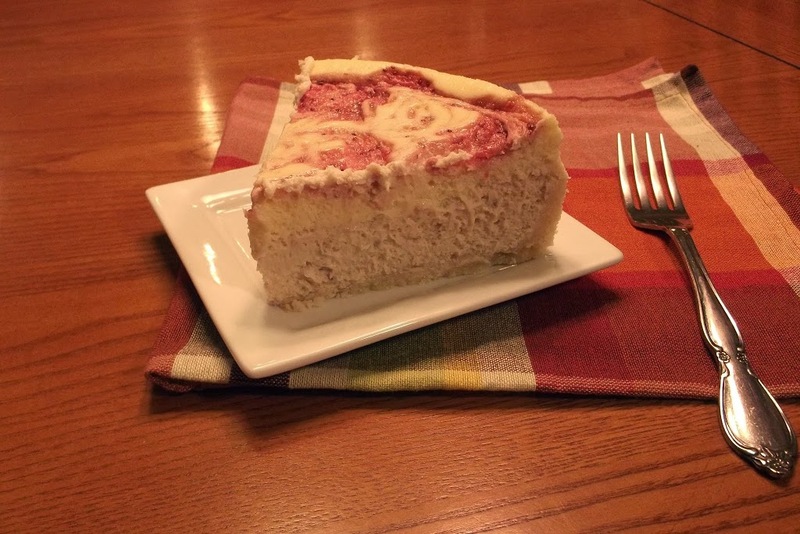 Just as well; one of my favorite desserts to bake are cheesecakes, so this suits me just fine. The cheesecake takes a little bit more work than your usual cheesecake, but it was well worth the extra work. It turns out creamy and as it bakes it smells so yummy. As you can see by my pictures the top of it cracked a little bit (I hate when that happens) but it didn’t hurt the flavor at all. 1. In a small bowl, combine the flour, sugar, and lemon peel; cut in butter until crumbly. Pat dough onto the bottom and I inch up the sides of a greased 9-inch springform pan. Place pan on a double thickness of heavy-duty foil (about 18 inches square). Securely wrap foil around pan. Place on a baking sheet. Bake at 325 degrees F for 15-20 minutes or until lightly browned. Cool on a wire rack. 2. In a large bowl, beat the cream cheese, sugar, and flour until smooth. Beat in cream. Add one egg at a time and beat on low speed until just combined for each one. Stir in lemon juice and vanilla. Pour 2 1/2 cups of the batter into a bowl; set aside. 3. Stir 3/4 cup of pureed strawberries into remaining batter. Pour into crust. Place springform pan in a large baking pan; add 1 inch of hot water to larger pan. Bake for 35 minutes. 4. Carefully pour reserved batter over bottom layer. Spoon remaining pureed berries over batter. Carefully cut through top layer only with a knife to swirl. 5. Bake 40-50 minutes longer or until center is just set and top appears dull. Remove from water bath and cool completely on wire rack. Refrigerate overnight. Worth it to see the smile on your daughter’s face, I’m sure! What a beautiful cheesecake! Your pictures of this cheesecake are just beautiful. Wish I had been there for your daughter’s birthday, I love strawberries and cheesecake. 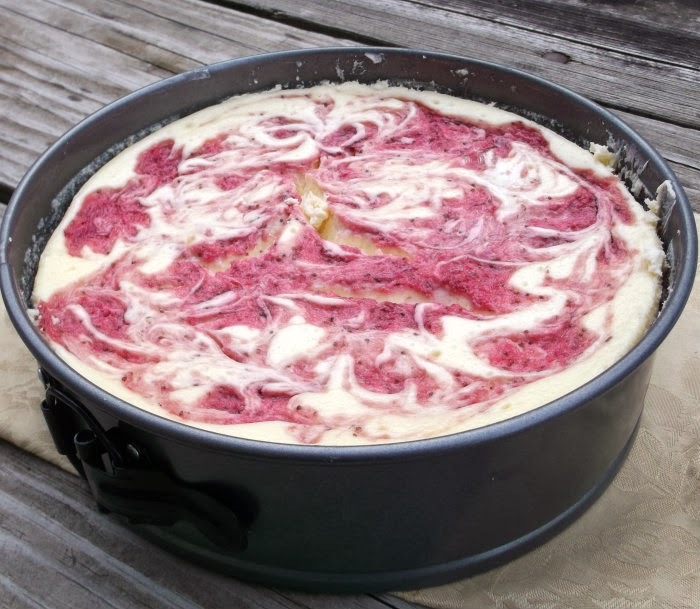 I love cheesecake, this one sounds great and I like the swirliness!